Triggering an international terror emergency, around 400 jail inmates, lodged inside highly guarded Central Jail, Srinagar late Thursday night attempted jailbreak after destroying surveillance equipment and other infrastructure. In a major breach of security, these jail inmates, which comprised under trials, convicts, foreign mercenaries, separatists etc, used cooking gas cylinders and construction material to broke down the gates of their barracks and scaled the inner walls of the high-security prison armed with iron pipes and LPG cylinders. All through the night, they chanted ‘Azadi‘ slogans as chaos prevailed in the jail premises. The state government has ordered a probe into the matter by Deputy Commissioner Srinagar. Earlier, he had interacted with inmates at Central Jail and also inspected the damages done to Jail infrastructure, apart from ascertaining the sequel of events leading to this incident. Meanwhile, police have lodged a separate FIR into the incident. 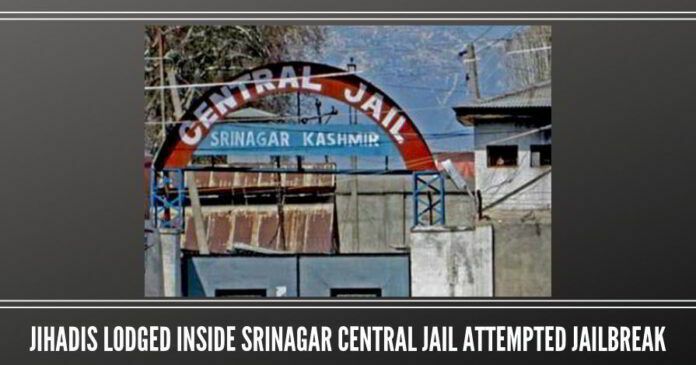 According to a report submitted by the Superintendent of Central Jail, Srinagar to the office of DG, Prisons, ” to accommodate jail inmates four new barracks were being constructed inside the central jail premises. On April 4 when prisoners lodged in the old barrack, no 1 was shifted to the newly constructed barrack in order to start the renovation work some portion of barrack was demolished which was being used by the inmates to carry out their anti-national/illegal activities”. The report said, “At the same time jail inmates lodged in adjoining barracks started raising anti-India slogans and within no time jail inmates came out of their barracks after destroying/breaking doors, window pans/ventilators”. “The jail inmates started pelting stones on the labourers as well as staff posted in the jail. The staff and labourers had a miraculous escape as agitated/violent jail inmates in the first instance broke out the door of the prisoner mess and taking possession of more than seven LPG cylinders, which they put on fire, at different places and in particular near the main gate”. “The jail inmates went berserk and started damaging the jail property. They also set fire the prisoner mess, canteen barrack which got damaged completely. The inmates also damaged all the doors and window shutters, broke glass pans of all the barracks”. They also damaged main jail deodi, broke LED High mass lights, uprooted CCTV pole, damaged/torn down electric cables. The jail inmates also demolished newly constructed segregation walls and all doors and windows of quarantine block. The watch towers inside the jail premises also suffered heavy damages due to stone pelting” the report said. 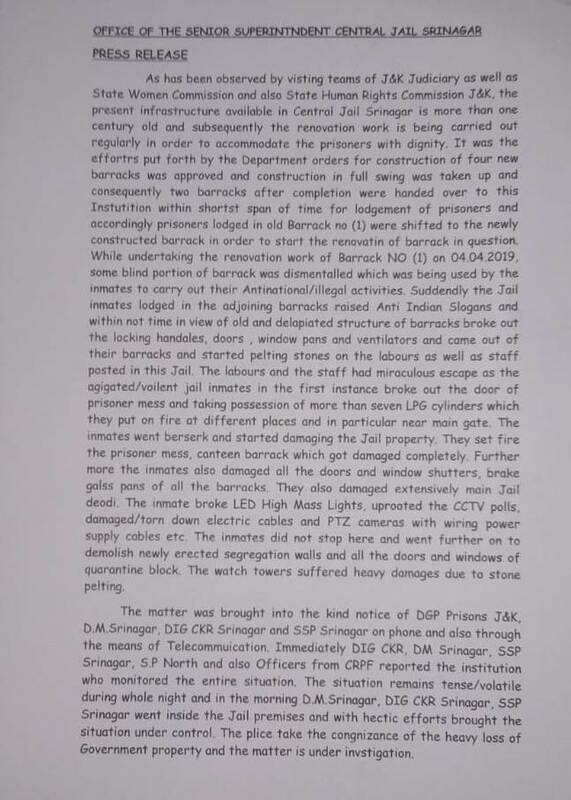 According to a statement issued by the state government “situation turned volatile as the jail inmates used inflammables to attack and damage the security grid of the central jail”. Massive stone pelting was also reported inside the jail premises. Apparently, elaborate planning was done before attempting the jailbreak. The jail inmates had even collected construction material dumped inside the jail for ongoing works to target the officers, security personnel and vehicles outside. Official sources said, “to contain the situation from slipping out of the hands fire tenders were pressed into action to contain the fire and disperse crowd”. The violent attacks continued for the whole night while senior officers camped there to contain the situation. “Despite announcements made on the loudspeakers the inmates didn’t relent”, official sources said. Deputy Commissioner Srinagar, Shahid Iqbal Choudhary, and Sr Superintendent of Police, Haseeb Mughal, also rushed to the spot to take stock of the situation. Early morning, the authorities constituted a dozen-odd team to move inside which included police personnel, CRPF component, jail staff and magistrates. However, after several hours of intervention, the violent mob didn’t return to barracks and massive damage was inflicted to the infrastructure. Later, Deputy Commissioner Srinagar Shahid Iqbal Choudhary held detailed deliberations with the representatives of inmates over a host of issues, in presence of DIG Central Kashmir, DIG CRPF, SSP Srinagar and other senior officers. The inmates were given to understand that no issues could be heard and redressed in the backdrop of such massive violence and attacks which had the potential of leading to fatalities, and the conducive atmosphere was required to ascertain the factors involved in violence of this exceptional nature. The DC asked the inmates to move into barracks. After detailed deliberations, the inmates were moved to barracks and discussion held with all concerned. In view of massive damages to Government property an inter-departmental team comprised of PWD, PHE and PDD were deputed by the district administration for loss assessment and restoration work. Official sources claimed the incident was triggered when the inmates resisted the move of jail administration for the restoration of barracks which have been damaged over a period of time. A spokesperson of the administration stated that some pictures were being circulated in social media indicating an alleged desecration inside central jail however fact of the matter remains that during entire night no security personnel, or officials, moved inside the barrack premises and all the issues raised by the inmates are being ascertained however violence and mob-attack of such a level cannot be condoned. Previous article23 Sculptures found in the offices of Nirav Modi – how much are they worth? Why waste money on these Jihadis? What do we gain by keeping them behind bars? They’ll never change. You let them free, it is back to square one. The only way to deal with them or their kind is to finish them off once and for all. I am puzzled why such clarity of thought is lacking in our politicians. If jail authorities don’t have mechanism to control the imprisoned terrorists, the situation needs massive modification. This is no way. For the current violence, to prevent recurrence, chain the inmates. Has Tamil Nadu become an independent nation within the sub-continent?